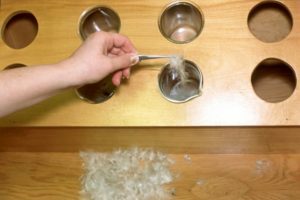 Feather Industries has an on-site lab where various testing takes places to ensure quality standards are met. We test every product we purchase, process and sell. A database is maintained referring every test to a specific lot. This ensures the consistency of the quality and that we meet or exceed all Canadian and International standards. Representative samples of every lot purchased, processed or sold are kept for a minimum of five years. All waterfowl feathers and down have a certain percentage of oil and fat, which allows the birds to repel water and keep feathers soft and pliable. In the cleaning process the majority of the fat and oil must be removed, however if too much is removed, the Down can become brittle and its insulating and lofting abilities are compromised. Therefore, it is important to filter the fat and oil accordingly to produce a balance between the weight and the pliability of the feathers and Down. 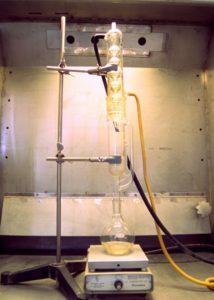 To test for fat and oil content a sample of distilled water, pretreated with the down being tested is added to a Pyrex beaker and mixed with Ether. This mixture is heated and through a series of regeneration processes, the fat and oil is extracted and weighed. Industry standards are set at a range between 1.5 percent and 3.0 percent. Feather Industries falls within that range. To determine the cleanliness of our product, distilled water is filtered through a sample of down at various stages. Potassium nitrate is added to determine the level of oxygen present. The lower the oxygen level, the cleaner the water is, therefore the cleaner the Down. Industry standards are set as 20, however, Feather Industries consistently exceeds these minimum standards. In fact, any products that are above 10 we do not consider processed. 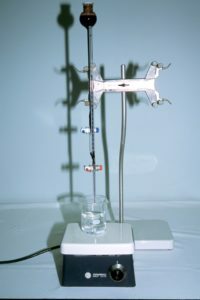 In conjunction with the oxygen test, the same sample of filtered water is poured into a thousand millimeter Pyrex tube. 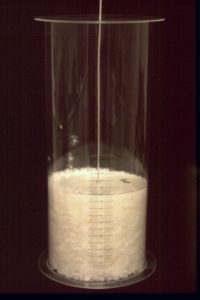 Small amounts of filtered water are released until an indicating mark at the base of the tube can clearly be seen indicating the amount of suspended particles in the beaker. The clearer the water, lower the level of the turbidity and cleaner the products. Industry standards are set at 300mm, however, Feather Industries will not ever release a product below 600mm and consistently measures to 1000mm and higher. The bulkiness or fluffiness of down is often referred to as Filling Power or loft. The greater the ability of down to fill an empty space and trap air indicates a higher level of quality, lightness, and resilience. To determine the Filling Power, a one ounce representative sample is placed in a Plexiglas cylinder. The sample is then conditioned for 72 hours in a controlled environment. A “paddle” is slowly released into the cylinder and compresses the sample until the “paddle” stops. At that point the level is measured which indicates the ability of the sample to trap air. This step is repeated twice more and the average of the three levels is calculated to determine the volume per cubic inch of filling power. Generally speaking the greater the Loft number is, the higher the quality of down. 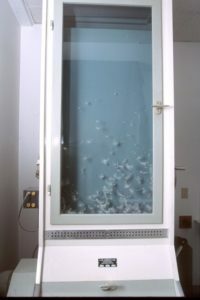 This sample shorting machine is used to separate Down from Feathers. Currents of air cause heavier feathers to collect in one chamber, while the lighter down floats and collects in another. The function of the machine is to quickly estimate down content by weight vs. feather content by weight. For precise measurement hand separation is required. 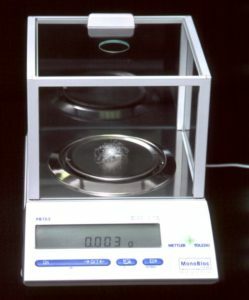 A precise, digital scale accurate to one thousandth of one gram is used to prepare down and feather samples for a variety of cleanliness and performance tests. From the picture you can see the accuracy. A hand analysis test is used to determine the down content, fibre content, feather content and residue content of a sample. Various components of the sample are separated by hand and weighed. This weight is compared to the total weight of the sample to determine a down percentage. Waterfowl fall into two commercially used species, Duck and Goose. Duck and Goose have microscopic nodes that occur on the fibres of the feathers and down. Each species of Duck and Goose has a distinct pattern of spacing between these nodes. 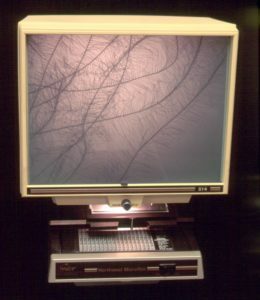 A sample of the feathers and down are placed under magnifying instruments to identify the species by analyzing the spacing and consistency of these nodes..
For a product to be labeled as Goose a certain percentage of Goose Down clusters or feather must be present, and internationally this percentage varies. In Canada and the United States the minimum percentage is 90%. Copyright © 2018, Feather Industries. All rights reserved.